There are not enough hours in the day. That’s all I’m saying. You know? My girlfriend and I went for a walk to the store, and on the way back we adopted a kitten. “Babette” was a stray who approached us near an apartment house. We found some tenants who lived there, who said she lived under the porch, had no owner, and her momma had gone away. Poor thing has a URI and gunky eyes and ear mites, and frankly, who knows what her fate might have been. FYI, I think there’s an extra “with” in the last panel. I was so pissed when I saw you’d left Emily in Cliffhangersville, but how can I stay mad when you give me more Dmitri? I love Dmitri. I mean, the entire cast is awesome but doesn’t everyone love Dmitri the *most*? Just a question though – is the second panel here supposed to be pretty much identical to the 10th panel in “Dmitri is Debugged”? Oh whoops, ignore that comment – just noticed that it’s a different cloaked dude he’s talking to. Those cloaks aren’t just stylish and comfy – they really do conceal identities! You did a good thing rescuing the kitty. My daughter rescues abandoned kittens, or rather, she fosters them until they can be adopted. She has fostered dozens, names each one and wishes she could keep them all. She cries if one dies from disease that the vets just cannot cure. She’s a good kitty mommy. I hope yours does well and thrives. I’m thinking we need a ‘secret society’ tag. Or even a ‘this is not the secret society you’re looking for’ tag. We got adopted by three kittens a while back. The owners of their mother were… really negligent, and didn’t want them in the house. They also neglected to get momma-cat spayed…. so we wound up sneaking her along to the vet with the other three. They never noticed. Wow, when I started reading I thought Dmitri would be a comedy character who would waste his time in space sleeping with anything he could. And I was right. But somehow during all that he has also become one of the most productive member of the group. As he says he has almost single-highhandedly achieved all of the crews original mission and gotten rich while the rest of the crew was busy getting into trouble and going crazy. My fave character by a wide margin. Ah, Babette looks just like my own dearly departed Hieronymous. May you experience years of love with that pretty kitty. As for the strip: I tend to automatically disbelieve any claims to run anything as large as a continent (Australia being the exception to prove the rule) so claiming to run the UNIVERSE is met with immediate and intense skepticism. It is too large, especially for a group of bumbling cloak wearers. Another Dmitri fan here. There’s not a page that he’s on that doesn’t make me grin. 5th panel, the “not” doesn’t fit. He’s trying to say that it would be hard to be confused, not that it would be hard not to be confused. Maybe he could say that it would be hard to not be not confused. @Pete, ‘secret society’ tag added. @Robin Bobcat, that is awesome. So glad you did that. Spay = Good! @Ronald, good catch! It should be “Galaxy” and not “Universe,” will fix that now. 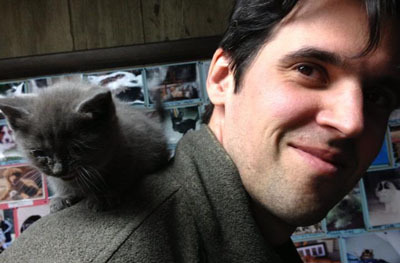 Bless you, Christopher, for giving a home to that beautiful kitten. Keep us posted on her progress. I do enjoy your comic & I always loved Little Dee, but my respect for you has increased greatly since I saw you adopted a stray. I hope she now has a forever home with you. I think Dimitri’s panel five dialogue was supposed to be “It’d be HARD to be confused.” Since he’s saying he’s not confused in the slightest. Ha! Got sidetracked. Changes are in. And thank you for all the adopted-kitty love! You just gotta love Dimitri. A most interesting conversation, someone so powerful yet no ambition. Like the perfect politician doesn’t want to be one. Fun fact: Any time Dimitri wants a drink, a dispenser magically appears on the nearest surface. It must be Dimitri’s super power. That would explain why he isn’t ambitious for more power. Most unfortunately, it’s not constitutional for a Russian-born person to be President of the United States. @Rhadamanthus, as soon as you mentioned “Little Dee”, an image popped into into my head. Babette looks almost exactly like the cat that was tormenting Blake when Blake was (briefly) domesticated. The Dos Equis guy may be “the world’s most interesting man,” but he’s got nothing on Dimitri, the GALAXY’S most interesting man. Come on, Demitri, run the sexual compatibility test on them. You know you want to. Youngest daughter wanted a pet rat; guess she’s got one now! I just read the novel Unnatural Habits, by Kerry Greenwood. It is the latest in the Phryne Fisher mystery series, but I mention it here because of the surreptitious spaying mentioned earlier. It is set in the late 1920s in Australia. One subplot is that assorted men who have gotten unmarried women pregnant are being assaulted and waking up with a sore crotch. It eventually turns out that the assault consists of chloroforming and a quick vasectomy. Oh yeah, one of the men was married but the father of 11 kids. When Phryne Fisher found out who the mystery surgeon was, she passed on the business card for a solicitor in case the surgeon got caught. Ah, that most vexing and hated of individuals to shadowy enterprises: a powerful leader you cannot bribe or blackmail. We need more of them.